You can shop the Avon Catalog 5 2019 online beginning February 5 2019 thru February 18, 2019. Back order from this Avon Brochure February 19, 2019 thru March 18, 2019. Receive Free Shipping on all orders of $40.00 or more. 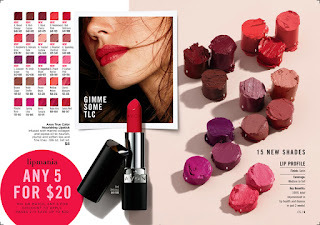 Lipmania customer offer: Any 5 lip products for only $20 (pages 2-11 C5 brochure). 15 new shades: More options than ever to flatter all skin tones. Infused with marine collagen and jojoba oil to nourish, plump and soften lips. Delivers 100% total improvement in lip health and dryness in just 2 weeks.